As a retired producer who worked at the national level at both CBC News and CTV News I was appalled at the superficial (to say the very least) coverage in English Canada of the shooting at a Quebec City mosque last night , January 29, 2017. So were many people. The news was coming in on Twitter and Facebook, not television and along with the real news (and the fake news) there were complaints that neither CBC nor CTV had any coverage. The viewers were demanding television coverage from both the public CBC and the private CTV. While Societie Radio Canada and its French language private competition TVA were live and in-depth, the CBC National broadcast on both the main network and News Network had nothing more than a minute of a phoner voice over. A disgrace for a national public news service. At 11 pm, Pacific, that’s 2 am Eastern, CBC News Network went back to a canned documentary while BBC World devoted much of its newscast to the shooting. This is the age of instant communications. Mobile phones. Text. E-mail. Twitter. Facebook. It is obvious that in this age of 24/7/365 communications neither network news service has an emergency plan. Probably in the view of bean counters and consultants news happens most often when there is a regular measurable audience and a newsroom is fully staffed (or as staffed as much as today’s budgets allow) and the new buzzwords like a “Hub” or a “Breaking News Desk” will always respond. The Hub and Breaking News desks can only respond if there are warm bodies with their bums in chairs actually in the newsrooms. Maybe the network news bosses should bring an old analog era procedure that actually got (real) breaking news on the air fast. It’s called a phone tree. Back when I was starting in journalism 40 years ago, the days long before Breaking News became nothing more than a marketing gimmick, there were emergency plans and procedures and when the fertilizer hit the fan you learned quickly how those procedures worked. Even if you were a lowly editorial assistant (a job that no longer exists) almost all alone in the newsroom. These long forgotten procedures were created (I was told at the time) when the Greatest Generation returned from service in the Second World War to begin or resume careers in journalism and they damn well knew what an emergency or breaking news really were. On September 28, 1978, it was just after one in the morning at the old National Radio Newsroom on Jarvis Street in Toronto. The evening staff had gone home. There was a writer for the hourlies for western Canada. The late Doug Payne producer of the World at Eight was preparing the show. His writing and producing staff would not be in for a couple of hours. I was the editorial assistant. It was still the days of clattering teletypes in a side room. Nothing had moved on any of the teletypes for an hour. Nothing. Then suddenly the Reuters machine literally went nuts. Normally five bells on an old teletype was a Bulletin. A Flash was seven. This time the machine rang 28 bells. (I saved the carbon copy and counted them later) The new Pope John Paul I was dead. (He had been in office just 33 days). I was stunned for a few seconds, then ripped the paper and ran over to Doug. Doug knew what to do. He knew the phone tree. First I was to call the then senior assignment producer, Bob Dowling. Second and only after I had called Dowling, who could start getting the foreign desk and reporters mobilized, I was to call the then managing editor Eric Moncur. Doug and the writer under CBC procedure at the time (not these days) waited for the CP/AP confirmation. They then prepared the network bulletin and after that the last two hourlies to the west. Doug told me that once I had called the boss, I was to call in all the morning staff for both World at Eight and Hourlies, starting with producers and senior technicians, then writers and junior technicians. Overtime was no problem. The early morning EA didn’t answer (I later learned he was spending the night at his girl friends’) so I was told to call in the mid-morning EA. Doug then told me to call Frans, the nearby all night restaurant and order breakfast to go for 30 people. As soon as the mid-morning EA got in, he was sent out again in a taxi, with an envelope full of cash to collect the breakfast. (Eggs, bacon and sausage). In Toronto, noise bylaws forbade the Catholic Churches’ bells from ringing until 7 a.m. But as the World At Eight went to Atlantic Canada, the listeners could hear LIVE, those bells ringing. A year later, on November 10, 1979, it was a deadly Saturday night. There were two people in the radio newsroom, myself and the hourly writer. Down the hall a producer for Sunday Morning was putting the last minute touches on a doc that was to air that morning. It was five minutes to midnight. Five minutes until the switchboard closed. It was then the phones started to ring. There had been some kind of huge explosion in the west part of Toronto. At midnight those calls stopped. Those calls were enough for me to follow the phone tree procedures and call Bob Dowling. It was soon after that that news staff began calling on direct lines, not just from the west end but even from high rises in downtown Toronto, telling me there were huge flames in the west. A Canadian Pacific train had derailed in Mississauga at 11:53. So those warning phone calls from the public had come almost instantly. Dowling went through the phone tree, calling in staff and alerting reporters. Then he called back and ordered me, the most junior person and the available warm body to get out to the scene until a national reporter could relieve me. There was a problem, the weekend CBL (local Toronto radio) reporter had taken the staff car and he couldn’t be contacted. So Dowling authorized a technician who should have gone off shift to drive me on overtime to the scene in his personal vehicle. As soon as we got on the Gardiner, we could see the flames reaching 1500 feet into the air; we eventually got to the scene, and (in those days) were waved through the police barricade to a parking lot designated for the media. Even for the TV people who were also arriving this was long before the days of easy live coverage. But there was a quick police briefing within a half hour or so. Soon after the briefing, a national reporter arrived, so the tech and I drove off to find a place to file. In those days that involved taking a phone apart and using alligator clips to send audio from a tape recorder back to the newsroom. Then, the tech and I went to a mall that was an evacuation centre that was already filling up, for interviews. We were back in the newsroom by 5 am, which by that time had all hands on deck. On August 19 1991, I was a writer at CTV News in this case the Sunday news with Sandie Rinaldo. It was a dull, routine Sunday night with (as far as I remember) until about 11:25 when once again it was Reuters, this time on a green CRT screen tied via some badly written software to a mainframe, that sent the Bulletin that the Communist Party of the Soviet Union had announced that Mikhail Gorbachev was no longer in office. It was the infamous August coup. I called the show producer Jennifer Harwood (now a CBC News manager) and read her the bulletin. Normally on a Sunday night after the control room told us “tape is good” everyone would go home. The control room called, tape was good, but there was no call back from the producers saying they could go home. Everyone was reading the wires. Control room called back, “What is going on?” So I told them and told them to stand by. The coup meant that there had to be a whole new show with real breaking news put together in now less than half an hour. At the same time, the CTV phone tree was activated. Calls were made to then CTV VP of News Tim Kotcheff and senior assignment editor Dennis McIntosh. The midnight show to Central Time Zone made it to air (of course) and then after that show was off the air; there was a full network special report aimed mostly at the eastern, Atlantic and Newfoundland stations that had already broadcast the original newscast. That’s how the system was supposed to work. That’s how it worked at both public and private networks when the networks had executives and managers who knew what they were doing. My sources tell me that at CBC there is minimal staff assigned to the Sunday National (unlike the old days when the Sunday National was a flagship that led the rest of the week.) and even the English Montreal local CBC newscast was a disaster. This news disaster is the result of decades of budget cuts, staff reductions and misleading viewer analytics that say it isn’t worth money investing in weekend coverage. At CTV I suspect that the parent company Bell Media has no real interest in actual news coverage in a demographic low point. CBC lost its way as a public broadcaster years ago, with too many managers and too many managers who know nothing about broadcasting and don’t consider news apart from marketing it. The CBC now has version 5.0 or higher of a so-called digital strategy. The news of the shooting was on Facebook and Twitter, not much even on CBC.ca (they can’t do much if there’s one writer and no reporters on scene to feed information) and everyone in English Canada was waiting for CBC to go live with real reporting. It never happened. In these days when all the media is in deep trouble, there are some things you can’t fix. But one thing can be fixed. Remember the Greatest Generation. Remember the old Journalism School 101 adage. Never Assume. Never assume that news is going to break when you’re expecting it. Come up with a real 21st century emergency plan and bring back that old analog frigging phone tree system and when there is real breaking news get it on the air and out on digital and social media whether it’s on Wednesday afternoon or Sunday night. Accurate and fast. Accurate is crucial in the age of fake news on social media. I intend to write a longer blog on the raging debate over Kai Nagata’s now famous blog about his resignation from CTV News, Why I Quit My Job putting it in a wider and historic perspective. Throughout my career I’ve known people who have gotten fed up in the way Nagata did and quit. So quitting is nothing new and I will include that in a future blog. As the backlash against Nagata grows, I think a crucial point has to be made now. As I said in some Facebook and other posts, Nagata’s blog wouldn’t have gone viral if it hadn’t touched a cord with a lot of people, including many of his generation. The blog has an audience around the world that is still growing. A lot of people are now saying Nagata is a self-indulgent egotist in his mid-20s. Maybe. Elders have attacked restless, ego-driven 20-somethings since the first agricultural settlements in Anatolia seven thousand odd years ago. Many influential voices in journalism are saying that Nagata should have stayed and fought. One of the latest comments comes from someone highly respected in the broadcast news industry, Howard Bernstein, Quitting Solves Nothing. Nagata isn’t the only talented young journalist who has quit the business (although it looks like Nagata didn’t hold out as long some people). I know other people in their 20s in Canada, the US and the UK who have also quit but who haven’t voiced their dissatisfaction so eloquently as Nagata. So perhaps quitting does solve the problem of knocking your head against a brick wall. It feels so good when you stop. for those jobs so fierce that the managers who actually want talent have their pick, then why are so many of the best and the brightest who can quit (not married, no mortgages, not overburdened by student loans) actually quitting? I have seen Facebook and other postings from very talented journalists and former journalists, I know, all in their late 20s, early 30s, (and whose work I respect) all saying Nagata is right. Most of the criticism appears to becoming from an older age set, from late 30s up until retirement. The second and more important question is where’s that all important audience that the media managers keep telling us they are trying to serve? The audience for news among the 20 to 30 demographic is dismal. Those dismal figures go beyond the supposed disinterest that age group has in news. This is the demographic that the advertisers supposedly hunger for, supposedly would kill for: 18 to 34. Where are that audience? Not watching TV news, that’s for certain. Why are the news ads filled with safety bath tabs, reverse mortgages, non-medical life insurance and topical pain relievers? The advertisers aren’t that dumb, if the 20 to 30s were watching the news, you’d see a lot more ads than there are now for smart phones and tablets, computers, cars, adventure vacations and eco-tourism trips, starter condos and the furniture for those starter condos. Instead the ad dollars are going to attract poor, aging, arthritic, worried boomers. At the same time, in any TV newsroom, the managers go on and on and on and on about the “younger audience” while producing the kind of news piffle that led Nagata to quit and has driven that audience away. The 20 to 30s are also not reading newspapers, at least on paper, they browse online at the free news buffet. It’s not just that they are part of the download generation who expect free stuff. The news media hasn’t produced anything that they think is worth paying for. After all they will pay for music on iTunes and for non-pirated software or anything else they feel has real value. The news media doesn’t produce anything that would attract an 18-34 audience that would mean advertisers would throw money at the media to get their attention. Like the rest of the audience, the 18 to 34 are titillated by Charlie Sheen’s self destruction and they did watch some of the royal tour by William and Catherine. But they are also concerned about the future of this poor planet and the crisis that climate change will bring and know that the media on whatever platform isn’t doing enough coverage of those stories. The current News International scandal, the closing of The News of the World (as well as the likely cynical substitution by the Sun on Sunday) and the continuing revelations about the abuses of the media owned by Rupert Murdoch (as well as the fact that Conrad Black is going back to jail in the U.S.) will do nothing to improve the trust in the media among younger people. So it’s not just Kai Nagata that’s quitting the media. It’s the whole damned demographic. The real story is not Kai Nagata, it’s an entire generation, that all important audience, disillusioned by the metric driven nonsense that consultants tell managers this generation (that isn’t watching or reading) want. For my friends and colleagues who are still in the business and are still fighting from the inside, good for them, they might (might) make a difference (maybe). However, we must remember the definition of insanity, if you keep doing the same thing over and over and get the same result, and you don’t change what you are doing and keep doing the same thing, you must be insane. While there are small victories in those internal fights, the important strategic battles are being won by the beancounters and metric mad managers (who are picking up their huge bonuses on their way out of the office each weekend). Some of those young people, some still journalism students, and many who quit their jobs without publishing their manifestos, who I follow on #futureofnews are working to create their own start-ups or exploring new forms of entrepreneurial journalism or are struggling as two-track freelancers (both working for the current media and working to innovate). So it is likely that if anything saves journalism. it will come from one of those quitters who are free to create a new model and mode of news delivery. Maybe that’s why Kai Nagata touched such a raw nerve with the (the cliche) main stream media. Is the future of news a town crier? A town crier with a baseball cap rather than the traditional three-cornered hat? I’m not kidding. Here’s why. On the afternoon of Nov. 18, 2009, the Toronto Transit Commission shut down the main north bound subway from the city’s downtown due to safety concerns after a contractor (not connected to the transit system) damaged a bridge over the subway line. 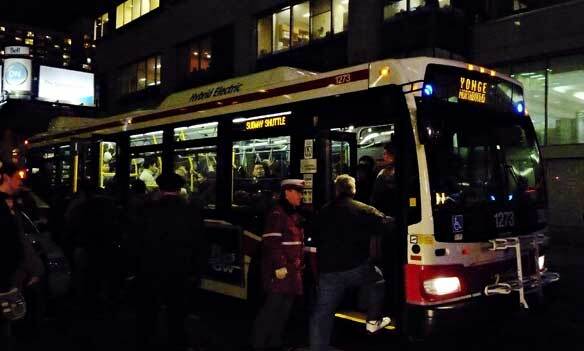 That stranded thousands at the main downtown crossroads of Toronto, Yonge and Bloor Streets.Many of those thousands of commuters had to line up for more than an hour to catch a bus. The system was actually restored ahead of schedule by the middle of the evening. I arrived at Yonge and Bloor (according to the EXIF time code on my camera) at 6:33 p.m. The crowd of waiting commuters snaked around the office building at the corner of Yonge and Bloor Streets. One bit of good news was that this mid-November evening was unseasonablly warm. I had my camera with me and began shooting. I was also wearing my CBC News baseball cap, which is a lot more visible to the public than a media ID card around one’s neck. People kept coming up to me and asking me what was wrong with the subway system. It happens quite often when a media person is at an event. But usually it’s at a demonstration and the question is “What are they demonstrating about?” If it’s a crime or accident scene, it’s “What happened?” In both of those cases, it’s pretty obvious what is going on. That got me thinking about the ongoing debate about the future of the news business. Are we missing something? Toronto is a media saturated city. There are four daily newspapers (all a bit shaky but none at death’s door, so far) (The Globe and Mail, Toronto Star, Toronto Sun and The National Post) five broadcast and cable networks (CBC, CTV, Global, CITY/Rogers and SunTV) three Canadian 24 hour cable networks (CBC News Network, CTV News Channel, CP24), radio stations too many to count–and they all have websites. Then there’s social media, lots of blogs in Toronto, including BlogTo which has become a web-based news service for the city. In fact, I first found out about the subway disruption from a @TTCalert on Twitter. Yet a significant number of people at Yonge and Bloor did not have any idea at all that their homebound commute was going to last a lot longer than expected. Are we missing the real “news you can use” in favour of some artificial variety created by a consultant? Gee, why weren’t these people checking news websites from their offices? After all the numbers show that the highest web news audience is during office hours. When I was a journalism student back in 74-75, the late Phyllis Wilson, a great prof, who taught at Carleton from 1966 to 1982, a former city hall reporter for the long -gone Ottawa Journal pounded into our (Watergate dreaming) heads that people want to know and need to know the basics, water and sewerage (always sewerage not sewer, Phyillis would say), garbage collection, street cleaning and why isn’t the bus running? Why isn’t the bus running? You know, fifty or sixty years ago, when there were still evening newspapers, there would be newsboys (yes newsboys in those days) hawking The Toronto Star five star final or an extra from the late Toronto Telegram that would have told the people in line exactly what was going on (at least up to the print deadline). Yet, last night, despite cell phones and smart phones and text messages and Twitter messaging to those phones, a good many people didn’t know what was happening and needed to know. The Good News. They saw someone with a media baseball cap and asked me and the crews from the other stations. So despite all our numerous failings and mounting problems, folks still go to the media for the news. Maybe there’s hope for us yet. Maybe we do need to be a town crier some time and shout out the news from a street corner. We certainly have to take a hard look at what we do and what kind of news we chose to deliver.